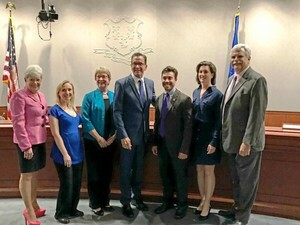 The Women’s Center is pleased to announce we are the recipients of an award from the State of Connecticut bonding commission in the amount of $991,056 for overdue critical repairs to our headquarters. These repairs will include replacement of the rubber roof, new wiring and other electrical upgrades, replacement of damaged HVAC units, installation of energy efficient doors and windows, and increased security measures. The Women’s Center gratefully thanks everyone who supported our bonding request over the past two years, especially Governor Dannel Malloy, Lieutenant Governor Nancy Wyman, State Representatives David Arconti and Bob Godfrey, and David Cappiello.